SHOW HOTEL: Candlewood Suites 13231 49th Street North, Clearwater, FL 33762 (727) 573-3344 2 miles from the show hall. You must call the hotel direct and book under our group name “SKYWAY CAT CLUB” for our special negotiated rate of $72.99 night, upgrade for $15 One Bedroom, no pet fee, plus tax. Rooms can be booked online here HOTEL LINK 903.7.1.1 Skyway Cat Club has elected to use the Hotel Room Inspection Procedures for exhibitors who lodge at Candlewood Suites using the club's group booking. Entry in this show, and lodging at Candlewood Suites using the club's group booking, shall constitute an acknowledgment by and consent of the exhibitor to these procedures. ​Are you a new exhibitor? ​Do you want to come to the show? BEST Decorated cage contest ! ​Find that purrfect Red Hat with Purple for the rest. 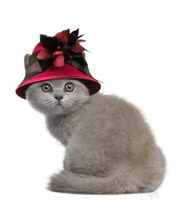 ​Explore your creativeness with our RED HAT CAT theme! ​Lots of fun stuff out there.